In the Diaper. How they get there!?!?. Wallpaper and background images in the पेंग्विन्स ऑफ मॅडगास्कर club tagged: penguins of madagascar skipper kowalski private. But you are now, Skipper. I bet he wishes now that he hadn't said that six episodes earlier. For the record, though, Skipper was never born; Skipper was hatched. But I digress. too funny and they are Lunacorns on the diaper!!! Skipper:I was't born yesterday.But if i was i woud be in dipers,wich I'm not..
skipper ur in soo much trouble! Skipper: This is the FRESH diaper, right? How did the three fit in the diaper??? Lol @ Private being upside down! 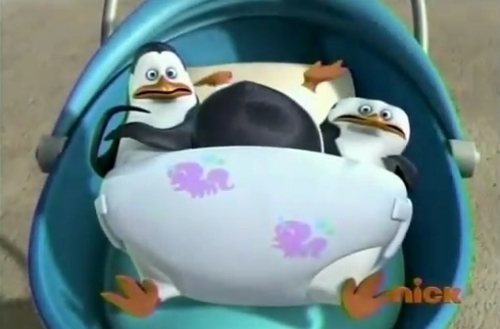 Also i luv Kowalski and Skipper's faces! Hahaha, The most expensive diapers with 3 in one baby may enter!! !